Tonight after the close Starbucks (SBUX) will report their Q4 earnings. The options market is implying about a 4.3% move in either direction tomorrow. With the stock very near $65.50, the Jan 25th weekly 65.50 straddle (the call premium + the put premium) is offered at $2.80, if you bought that, and thus the implied move, you would need a rally above $68.30, or a decline below $62.70 to make money on tomorrow’s close, or about 4.3% higher or lower, which is basically in-line with the average one-day post-earnings move over the last four quarters. As I said in the video clip, this is a simple way to play for a new high. 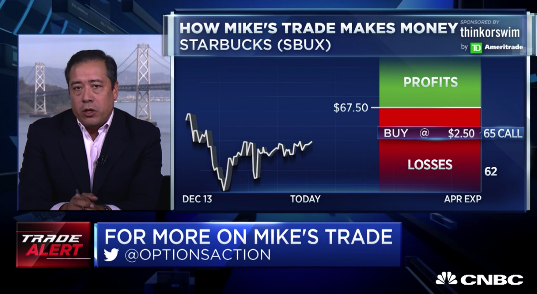 What’s interesting to me about the SBUX story is that despite the stock’s strong performance year over year, coupled with its impressive relative strength, analysts are still mixed on the name with 19 Buy ratings, 15 Holds and 1 Sell with an average 12 month price target at $69, or just about the prior all-time highs. 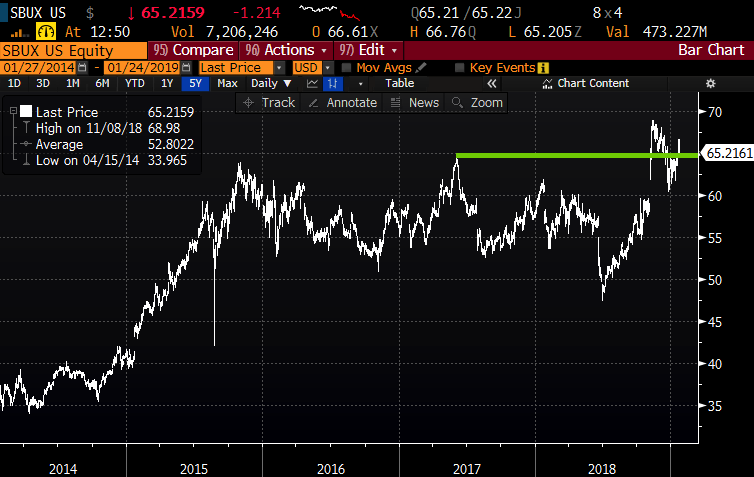 One reason for the hesitation might be that the stock trades near 25x expected 2019 eps growth of 10% on 6% sales growth with the potential for a backlash to U.S. brands in China as the trade skirmish presses on. I would add one caveat to my comment on the show, despite seeing some pretty aggressive pops today following earnings results, I see little reason to buy calls in this market playing for similar, I suspect in the coming weeks we will be able to buy most stocks at lower levels. 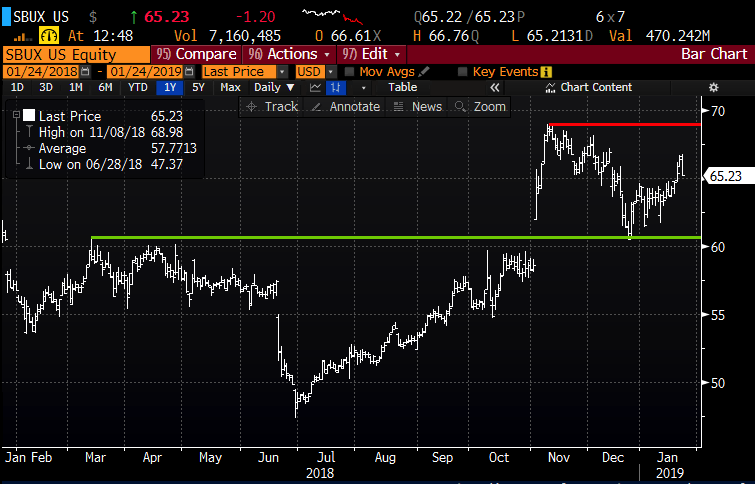 In the middle of the 3-month range, SBUX might remain in such a range until there is more clarity on the state of the U.S., European and Chinese economies. Gains of the stock up 2.50 with stock at 65.50 up to 68 (less the 30 cents in premium paid), stock called away there, but can always cover the short call to keep the long position intact. Losses in the stock up to 2.50 down to 63 (plus the 30 cents premium paid) but protected below 63. Rationale: one would collar their long stock into a potentially volatile event like earnings if they wanted to stay long, willing to give up some potential upside near term for defined risk to the downside.